Spray 10-inch skillet with cooking spray; heat over medium-high heat. Add mushrooms; cook 3 minutes, stirring often, until tender. Remove from heat; stir in spinach. In medium bowl, mix ricotta cheese, 1/2 cup of the Parmesan cheese and the salt. Spray 5-quart slow cooker with cooking spray. Spread 1 cup of the Alfredo sauce in slow cooker. 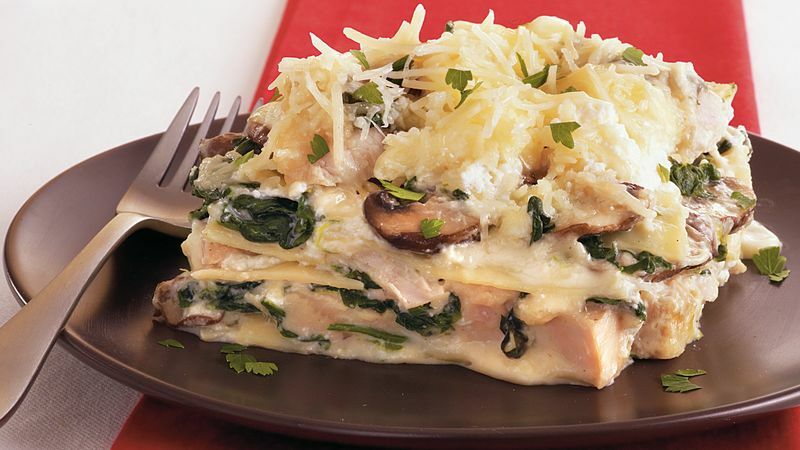 Layer with 2 of the noodles, breaking as needed to fit; 1 cup of the turkey; one-third of the spinach mixture; one-third of the ricotta mixture and one-third of the mozzarella cheese. Repeat layers twice. Sprinkle remaining 3/4 cup Parmesan cheese and parsley over top. Cover; cook on Low heat setting 2 to 3 hours or until bubbly and noodles are tender.